How About That Park in Lake Forest? I have many friends who live in the Lake Forest subdivision. 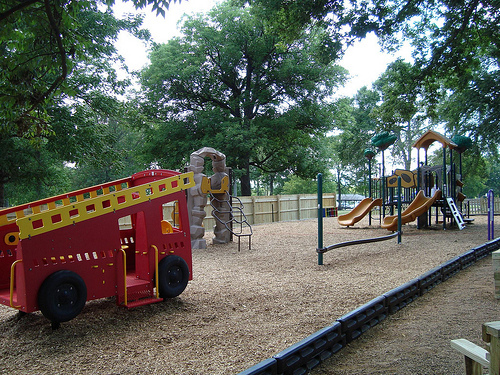 When they moved in, they were promised by builders that the developer would be building a wonderful playground in Lake Forest Park, located behind the police substation on Holland Ridge Dr. The park still sits nearly empty on top of a nice, green hill. There is a nice pavilion there and also a vandalized graveyard (we talked about that before). Why bring this up again, LaVergne? The city’s public relations director (our own Kathy T.) is in contact with several community groups to begin laying the foundation for a community-type build. The process will not be easy and it will take a village to make this a reality. But other communities all across the nation have done it, so why can’t we? With both groups, engineers come to town and have a “planning session” with children. The kids give their ideas for what they would like to see in a playground. The design engineers then go back to their computers and the next day “unveil” a design of what the children want. That’s when the hard work begins. This design would then give us an idea of how much money would be needed to fund, how many volunteers needed to build it, and how long it would take to do. Typically a 501(c)3 organization will help take the lead to allow for tax-exempt fundraising. Money can be raised through company donations and matched employee grants, individual donations, online through places like gofundme.com, and whatever other means people can imagine (how about a lemonade stand like the child in Detroit). If we come together as a community – whether you are a student, church, or other organization – just imagine what we could accomplish! 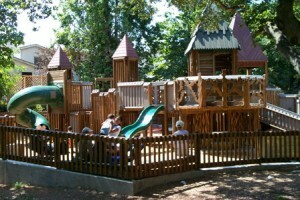 A community playground build would really be an attractive feature in the Lake Forest neighborhood and would GO FAR in adding value to the homes. How do we get started? If you or your neighbors are interested in participating in a community build, we need about 12 to 20 core volunteers to get the ball rolling. Are you interested? If yes, I urge you to contact Kathy by email ktyson (at) lavergnetn (dot) gov and let her know you’d like to be involved. Once she gathers a handful of names of possible supporters, she could schedule a meeting of those interested in being a part of this wonderful effort. Come on, folks! Time to get involved! Show your pride in community by helping the children of our town have another great place to play! I’m working now with my neighbors to see What we can do!! I’d love to know more! I live in Lake Forest.